What Are You Smoking?, February 2019. 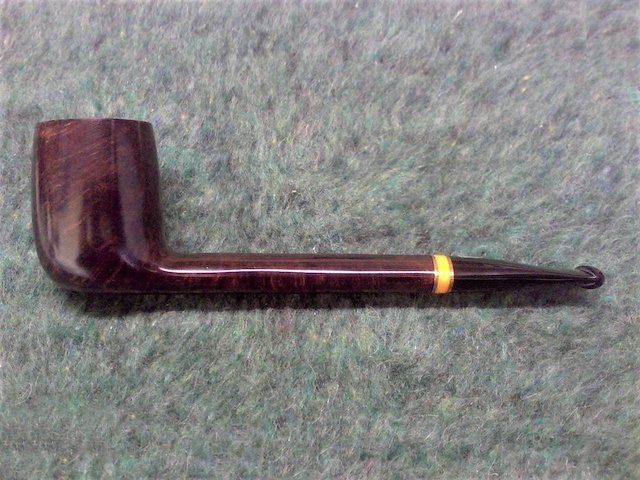 Starting this thread a few minutes early with a bowl of Dunhill Elizabethan Match in my trusty 1970s smooth three quarter bend Peterson System Standard 305 with a black vulcanite p-lip stem. Going back to work now. Decided one bowl of BCF/ODF wasn't enough, so reloaded and burning round two. More water! Westmoreland Mixture in a MM 5th Avenue on the way to work. Mac Baren HH Old Dark Fired Flake in my Peterson Irish Sea 606. Close to finishing this bowl of D&R VIP in a 2004 smooth long shank Canadian Trever Talbot Ligne Bretagne Faite en Bretagne 4/3 with a black vulcanite tapered stem. PA/LTF in a cob. O'Doul's. Watching Harvey Birdman, Attorney at Law. Last smoke of the day is Edgeworth Ready Rubbed Match in a very much appreciated 1979 brown, slight bend grain etched flat front Stanwell Rego 969-48 (09) with a black vulcanite stem. Just finishing a bowl of Cuban in a MM Legends with a bent amber stem. 'Dayyy from Greece and Athens with 15°C [or 59°F]. Kohlhase & Kopp Nr. 11 Honey-Rum. Two to post, both actually in January but I don't want to bump the wrong WAYS to the top. Tuesday's midday bowl was Crowley's Best in the Old England 59. Wednesday, I didn't get a bowl in, as I had been up since about 6 am and didn't get a chance to smoke until about 9:30 pm, and by then I was just too tired. Too tired to walk down to the garden, sit down, and smoke a pipe. Sounds crazy, but I had spent the entire day with a very active (and off and on very cranky, as she just had a major growth spurt) 4-year-old. Made up for it Thursday with a bowl of Haunted Bookshop in the Cobbit Gentleman. Looking forward to a bowl later this morning, not sure what I'll smoke but it will pretty much definitely be in the Old England. Finishing a bowl of Mac Baren HH Old Dark Fired Flake in my Peterson Irish Sea 606. A combo of Mac B Dark Twist Roll Cake and PH Special Curly in the PSF 2015 Altinok Meer with the mornings coffee. Sutliff Matured Red Virginia 515 RC in a smooth Grabow Eldorado 65 quarter bent Dublin. Hard to believe that it's February already. Good day folks, I'm on my second bowl of homebrew in a Parker. I went for a brisk walk in the icy park, before lunch. Sunny with clouds, 39°F. My weekend started with a Bojangles' Chicken Filet Biscuit, Bo Rounds and coffee and finished off with Prince Albert in a Rob Roy Cob. Happy Friday! Working at home due to weather, so it's a good smoking day! Started out with 5100 Red Cake in a Baki meer and now smoking A&CP Premier Cru in a Dunhill meer. Looks like next up is Germains 1820 in a BST.